Lottie dolls!! Have you heard of them? These lovely little dolls are inspired and created to empower children to be themselves, be creative and adventurous and of course to have fun! Lots of fun! 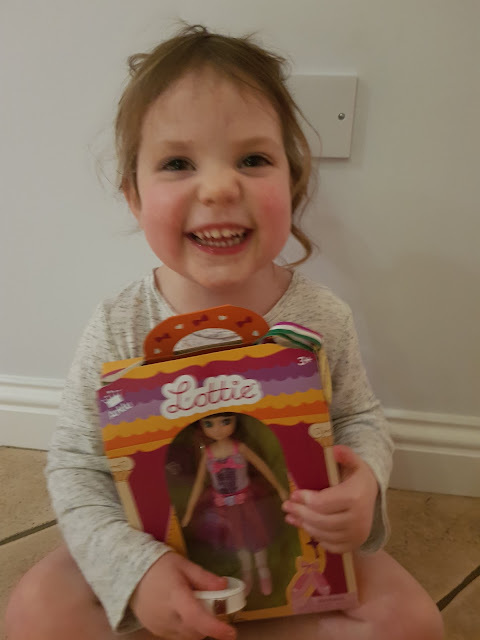 After reading up a bit around Lottie Dolls I love the ethos surrounding these lovable little dolls. They are dolls that look like kids, dressed in comfortable clothes with realistic proportions (based on a 9 year old) and include play sets that encourage outdoor activities. Now I do have to apologise for the quality of the photos, I only had my phone to hand and Elarna was so excited to receive a doll so had to snap away quickly to try and get some photos before she ripped her way into the box......little monkey! There are so many Lottie Dolls to choose from. There is muddy puddles Lottie, autumn leaves Lottie, snow queen Lottie, school days Lottie or fossil hunter Lottie - amongst many others! Elarna however chose Springtime Celebration Lottie. 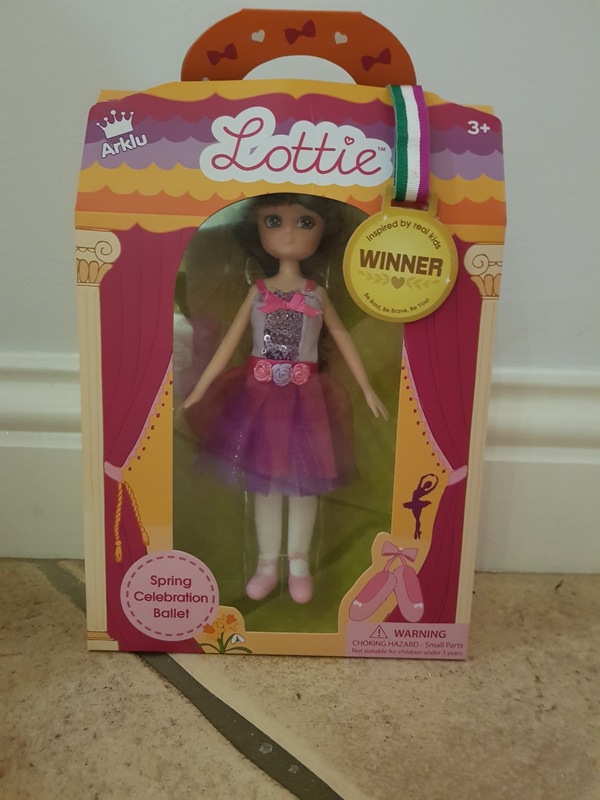 This doll is ready to dance in the spring celebration ballet at the The Old Theatre, she works hard to prepare her steps and loves to perform. Springtime Celebration Lottie comes dressed in a beautiful, special ballet costume comprising of a 3 layer tutu, a sequin leotard, a pretty pair of pink ballet slippers and a little drawstring bag to store her ballet slippers in. 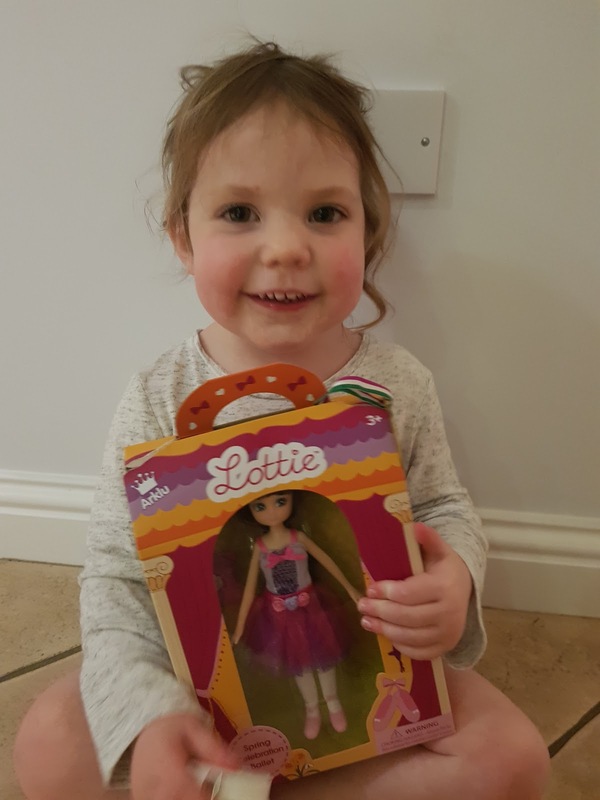 What do we love about Lottie Dolls? The diverse amount of dolls available. These aren't just your usual pink, pretty dollies, these are encouraging vocation and occupation and advocating girls (and boys) to be strong and follow their dreams. There are also boy dolls available if your child doesn't want a Lottie doll. The packaging is great, there is some lovely information on the box about the doll and the carry handle is great! The attention to detail. There are so many little details and thought put into the dolls, from the little ballet shoes, to the drawstring bag to the beautiful outfit, so pretty. Anything we're not so keen on? I guess the price, at £18.99 they're not the cheapest of dolls, however you are paying for quality. 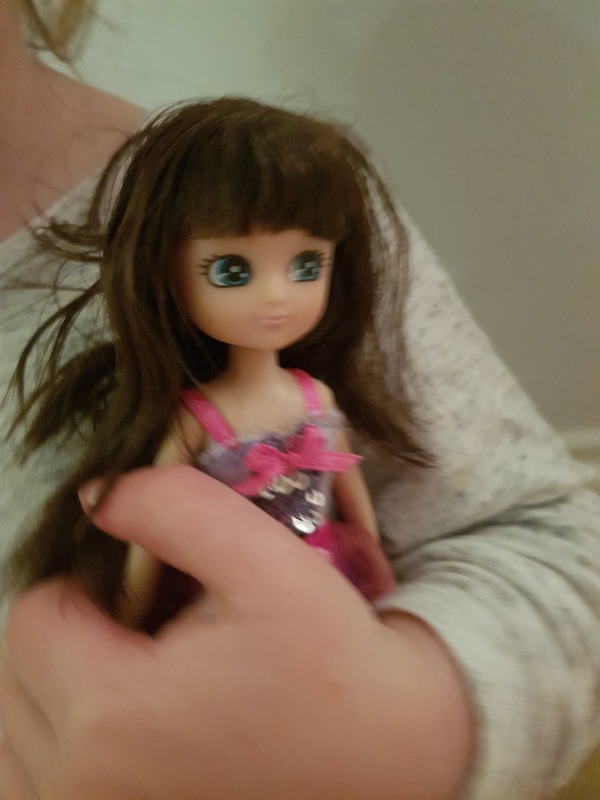 There are a few little bits included, this is fine but when you have a near 3 year old who is obsessed with removing items of clothing and shoes from her dolls then the chances of something going missing (i.e shoes!) is highly probable. 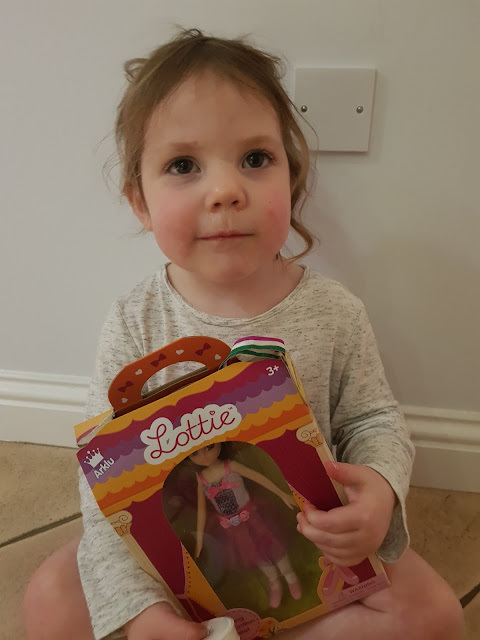 I really do love the Lottie Dolls collection as does Elarna, we'd heard about the range from a friend a couple of years ago and they loved them so I was pleased to be able to see them for myself and for Elarna to play with one. 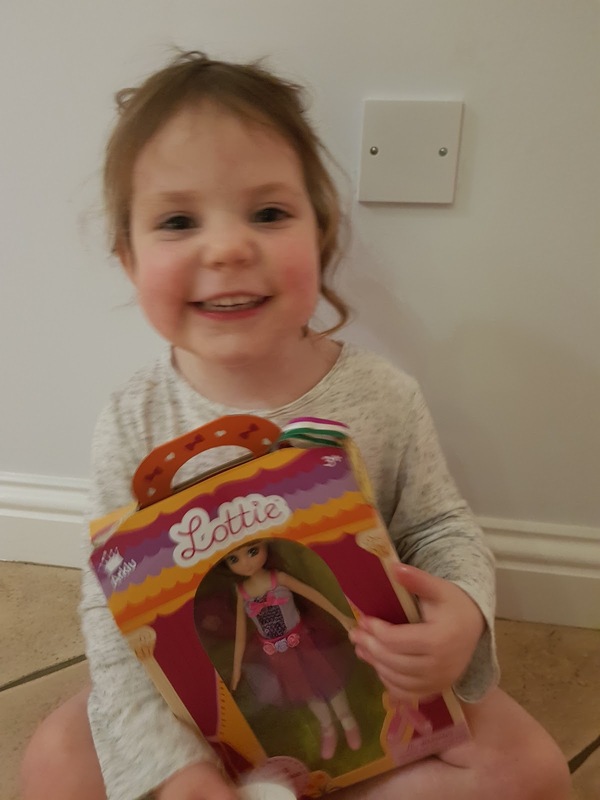 She has really taken to her and is often found playing with her in her dolls house or carrying Lottie around in her little handbag! These really are great little dolls and perfect for either a little girl or boy! 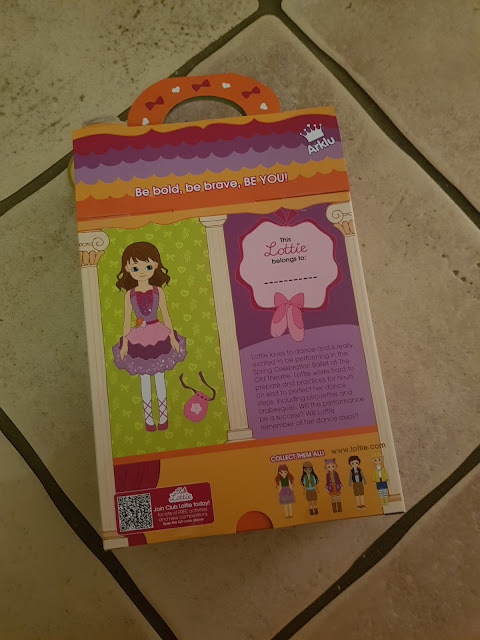 They are diverse in nature with endless possibilities and I love their positive message I will definitely be purchasing a few more Lottie Dolls, I have my eye on a couple for Elarna's birthday and I'm fairly certain she would be happy to receive another one. * Please note we were kindly sent a Lottie Doll in exchange for an honest review, all thoughts and opinions are our own. My little niece would love one of these. I've had to write this whilst my daughter is in the other room, so she doesn't see!! She would absolutely love these, guess what she's getting for her next birthday!